The MONOPOLY Game pays tribute to the King of Rock nâ€™ Roll and will captivate all who knew and loved Elvis and his music. 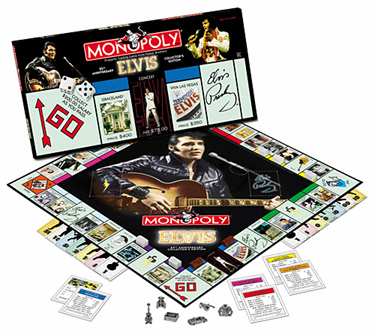 Vie to control the Elvis Presley empire, including his most memorable concert and television appearances, films, albums and hit singles as you wheel and deal in classic Monopoly style. Winner takes all. If you donâ€™t win, you ainâ€™t nothinâ€™ but a hound dog, cryinâ€™ all the time. This completely customized game features original photographs, movie posters, album and single covers and a host of other rarities. Comes complete with 6 custom pewter tokens: guitar, leather jacket, convertible, vintage record player, teddy bear and Elvisâ€™ sunglasses.